Many of our clients comment that they feel like they are “exercising before exercising” at the Body Firm. They are referring to “prehab”. What is it? To put it plainly, it is an important and proactive approach to avoiding pain and injury. Prehab exercises strengthen the most vulnerable areas that get stressed in everyday movement: your hips, core and shoulders. Strengthening these areas will improve posture and alignment, allowing your joints to move more efficiently. You’ll also build up your most injury-prone areas before you’re struck with chronic aches and pain that may, in the worst cases, require surgery. And…..wait for it…..prehab doesn’t have to be performed only during your training at the Body Firm or even at a gym for that matter. What Does Prehab do for Me? Prehab exercises prepare you for sports, exercise (obviously), and for life inside and outside the gym. There’s a good chance you spend hours hunched over in front of a computer every day. This lifestyle causes your shoulders to roll forward and tighten. That’s bad enough, but now let’s say that you go out and try to play tennis or golf. Since your shoulders are so tight, they lack the necessary stability and range of motion. Your body has a knack for compensating, however, and you end up using more of your elbows when you swing the racquet or club. That, combined with the poor joint alignment caused by your poor posture at work, could produce a nasty case of tennis elbow or rotator cuff issues. Long periods of sitting can also cause hips to become locked down and less mobile. The hips support the pelvis and have more musculature attached to them than any other joints in the body. Prehab movements help hips to have more mobility and stability so that they can keep your pelvis in alignment. When Should I do Prehab? Try for two to six times a week. It can be done at home soon after you wake up and it’s best performed near the start of your training session. Many prehab movements can be done with no equipment so there’s no excuse not to take 5 minutes of your day to do it as it’s one of the best investments you can make in your long- term health. Results? Prehab Helps Prevent Injuries. Here’s how all this proactive protection of your shoulders, lower back, and hips ultimately improves your life: About 65% of injuries—both athletic and lifestyle related—come from overuse, which is from repetitive use of joints that are rendered dysfunctional by muscular imbalances. Since prehab addresses the muscular imbalances that lead to injuries, it helps prevent many of the lower-back injuries, shoulder-joint problems and hamstring pulls, for instance. The other 35% of injuries are caused by trauma. If you have a bicycle accident or take a tumble on the ski slope, something is likely to break, regardless of how carefully you’ve followed your prehab training program. Still, prehab and the other components of your training sessions can improve your chances. Maybe, because of your balance and stability, you won’t tumble at all. Maybe you’ll tumble but not suffer as hard a fall as you would have before training. Professional skiers, for example, can walk away from nasty falls that would leave out-of-shape skiers paralyzed or even dead, because the pros have developed stability, elasticity and strength. And even if you do fall and get hurt, your conditioned body should recover faster from the injury. 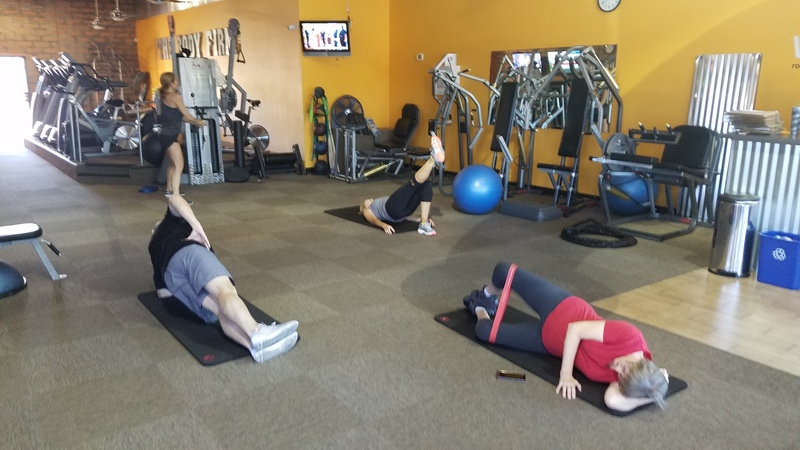 “Portable” prehab exercises include planks, quadrapeds, and glute bridges in various progressions, hip hikes, cobras, and balancing on one leg. Add a resistance band (very portable) and you can add clams, reverse/forward and lateral walks just to name a few. Building pillar strength through your prehab routine will take you a long way toward creating a body that’s capable of remarkable movement and, more important, is resistant to injury and long-term deterioration.